Pedestrian death rates have risen despite years of being on the decline. 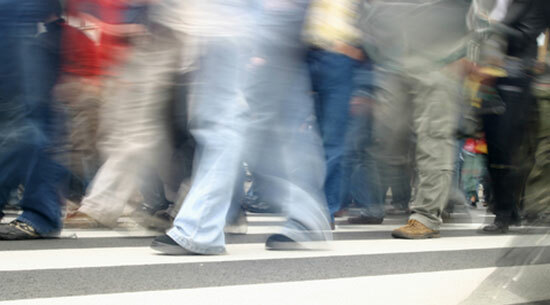 In 1975, more than 7,500 pedestrians were killed in traffic accidents. That number dropped to 4,109 in 2009, but by 2011, the amount of deaths rose again to 4,432. While officials cannot yet say for sure if the rise in deaths is a trend, authorities of major cities such as the nation's capital are paying closer attention to the number of fatalities. City officials acknowledge that in the past, pedestrian traffic deaths were often overlooked: they account for far less than 1 percent of all nationwide deaths. But as more people move away from using cars for commuting and as more elderly people remain in cities longer, foot traffic has gone up, and that percentage is expected to rise. D.C. officials reported that pedestrians accounted for 40 percent of all traffic fatalities from 2007 to 2011, compared to the national average of 14 percent. The capital's residents admit to dangerous driving around pedestrians: 9 in 10 residents admitted to speeding, running red lights, and failing to stop for pedestrians. In an effort to keep intersection crosswalks safe, some red-light cameras were installed. The city's actions decreased the 25 pedestrian deaths in 2007 to just 8 deaths last year, but the problem can't be solved by controlling vehicle traffic alone. Surprisingly, motorists are not the sole cause of the accidents. Often, pedestrians killed in traffic accidents were found to be walking impaired or walking while distracted, often while using a cell phone. In order to encourage safety and defense on the part of pedestrians, police officers are told not to be hesitant to issue warnings and citations for those pedestrians who blatantly do not follow traffic rules, such as jaywalkers. If you, or someone you love, were injured in a car accident as a pedestrian, you need to learn your legal rights. You probably have questions about insurance, paying medical bills, and supporting your family. At Edgar Snyder & Associates, we can help. Call us now at 1-866-943-3427 or fill out the form at the top right of this webpage for a no obligation, free legal consultation. You may have a case--call us today. "Pedestrian Deaths Trip Alarm." The Wall Street Journal. July 31, 2013.